Ozark Outlook is located on a hilltop with an incredible 30 mile view in three directions! This 3 bedroom, 2 1/2 bath home is decorated to satisfy folks who want a rustic atmosphere with contemporary amenities. Inside and outside fireplaces combined with an outside shower set the mood for camping in the woods. A copper bathtub and 7 foot master shower add to the romance of being in a special vacation getaway like no other! We want you to be so comfortable at Ozark Outlook Retreat that you'll look forward to coming home no matter how far your daily adventures in the Ozarks take you. My wife, Carol and I moved to Yellville in 2010 from Shreveport, LA after our children had completed their educations. We wanted to experience the simple side of life and take advantage of the adventures that north Arkansas and southern Missouri have to offer. For five years we've enjoyed the area's natural attractions and enjoyed meeting many local Arkansans. Additionally, we've met many folks who enjoy visiting our area to get away from the hustle of day to day life in the city. Interestingly, many visitors just want to slow down and breathe in a stress free environment. We built Ozark Outlook Retreat to meet the needs of any vacationers from those who require help on planning their vacation entertainment venues to those who just want to sit by one of our fireplaces and enjoy a bottle of wine. The reason to stay at Ozark Outlook Retreat is simple. We are conveniently located to all of the activities in the area. We are from 10 minutes to 1 hour away from any entertainment your can imagine in the Ozark area. Canoeing, kayaking, hiking, caving, shopping, fishing, fine dining, etc. Not only are these activities available, but Carol and I will be happy to assist you in planning your events. Our knowledge of living in the area for the past five years can help you get the most out of your vacation time. Personal attention to make your stay the best getaway you've ever experienced. Our location is Simply View-Ti-Ful! toilet, tub, shower, Copper Tub and a 7' shower with dual shower heads! toilet, combination tub/shower, tub, shower, Double stone sinks with trough faucets. shower, outdoor shower, Built with a bucket rain shower for an 'old time' feeling! Master Bath - Copper tub and a 7' walk in shower with dual shower heads. Lavatory has two copper miner's sinks supported by a rustic tree trunk with a cedar wood surface. Look for the raccoon hiding in the tree trunk! Upstairs Bath - Double stone sinks with copper fixtures on a cedar plank counter top. Tub with stone tile around the tub. Downstairs 1/2 bath with whiskey barrel and inset copper sink with water trough faucet. Outside Shower - Experience the fun of taking an outdoor shower under an old rain bucket surrounded by nature after a fun day of activities in the Ozarks. No sirens or traffic sounds here. Enjoy the sounds of nature and stargazing at night. Watch for deer and turkey every day. Sitting on an Ozark Mountain hilltop with a 30+ mile view in three direction which includes spectacular sunrises and sunsets. A great location to start and finish a fun day in the Ozarks! Dual central Air Conditioning units, separately controlling upstairs and downstairs for your individual comfort. Dual central heating units, separately controlling upstairs and downstairs for your individual comfort. Complete Laundry room with washer, dryer, sink and folding table. Antique ladder for hanging your clothes. Fireplaces! Inside propane fueled fireplace in the living room. Outside wood burning fireplace on the patio stocked with wood for relaxing at the end of the day with your family and friends! Plenty of parking for autos, motorcycles, boats, kayaks or canoes. No garage, but we do have a carport with some really big support timbers! An open floor plan for comfort and entertaining. The sofa is crescent shaped, seating five and includes three recliners. Fireplace and Big Screen TV with satellite and Blu- Ray player. Side by side refrigerator freezer with ice maker. New five burner gas stove with convection oven. Full size microwave built into the kitchen island. Make a full pot of coffee, or single cup of your favorite beverage. Includes Keurig cup feature. New toaster with bagel heating feature. Includes and old time pie chest as well as storage for additional items like a blender, crock pot, portable ice maker, etc. Fully stocked with service for 12, mixing bowls, cookie sheets, and utensils for all your cooking needs. Fully equipped kitchen includes dishwasher, gas stove, microwave, side by side refrigerator freezer, pantry, island, and all amenities. The custom designed dining table with bench seating creates a comfortable gathering area for meals and games. Kitchen island also seats four. 51' High Definition TV above the fireplace in the living area, and a smaller TV in the Master Bedroom. Both are connected to Direct TV satellite service. Connected to a variety of satellite music from Direct TV. Speakers are also wired to outside patio and the back porch. Blu-Ray player - Surround sound video/audio system in living room. Chess / checkers table in the upstairs loft. Also card games and board games available. Our area has a variety of rivers with rental services for various float trips. We will be happy to make referrals. We have both. Our patio is screen enclosed with a wood burning fireplace. There is also a deck across the back of the cabin with incredible views of sunsets! There are golf courses in our area and we will be glad to provide information relative to them. If you have any questions about our area, feel free to contact us anytime at 870-427-4277. We live in a wonderful area of our country and will be thrilled talk with you. An amazingly beautiful and peaceful home. Thank you so much for the very kind review of our cabin. We thoroughly enjoyed having you stay at our place and found ya'll to be our type of folks. We look forward to hearing from you again and promise to give you a call if we are ever in you neck of the woods. Again, thank you for being our guests and new friends! We spent 3 nights here for fall break. Got a bit, unlucky with the weather, but you couldn’t find a better place to spend a rainy day really. The porch with fireplace was perfect. Best equipped kitchen I’ve ever seen in a vacation rental. With their creativeness and attention to detail Bob & Carol have really made a cool place to hang out. When the weather got better we took some nice hikes close by, Rush Mount Loop and Indian Rock cave. Prior to booking our trip, I read all the documented reviews. My review is based on the house, the location, and traveling with children. 1. Not only can you see amazing sunsets, you can also see the sunrise. The house is located on the hilltop with incredible 360 views! 4. Location- yellville fit our family beautifully! To the family who wants to “get away, but still be present”, I had great cell service the entire trip. That being said, you can also have the amazing feeling of being million miles away from the world. The closest grocery store is only about 10-15 minutes away. Yellville has several good options for food, however with the incredible kitchen we chose to eat in. We enjoyed hiking the Indian rock house trail which was about a 20 minute drive and boating at bull shoars lake which was about a 30 minute drive. You are also within close distance to jasper and eureka springs. We are a military family who has limited time together and we work on a budget. I am thankful for the time that the owners spent making sure we had a memorable trip. My family made incredible memories and I hope to be able to book again at this location. Very relaxing!! Stars! Stars! Stars!!! Relaxing, peaceful, comfortable with beautiful views. Bob and Carol went above and beyond to make sure everything was perfect! House is absolutely gorgeous! We enjoyed our 6 mile hike to Indian rock house. We loved feeding the deer off the back deck. We will be back! We ha e stayed here a few times and the place is an A+. Bob and his wife go out of their way to make you visit one to remember. I would describe this home as a Rustic Transition Cabin. It has the rustic feel but the convenience you’ll find in the most modern homes. We really enjoy it and can’t wait for our next visit. For those looking for an outdoor experience literally out you back door, while your there feed the deer and turkeys that come by most evenings off the deck. Our kids love it! Wonderful cabin! Amazing owners! Awesome hospitality! Unique features that we've never seen at any of the other places we have ever stayed! Loved it! Thanks! 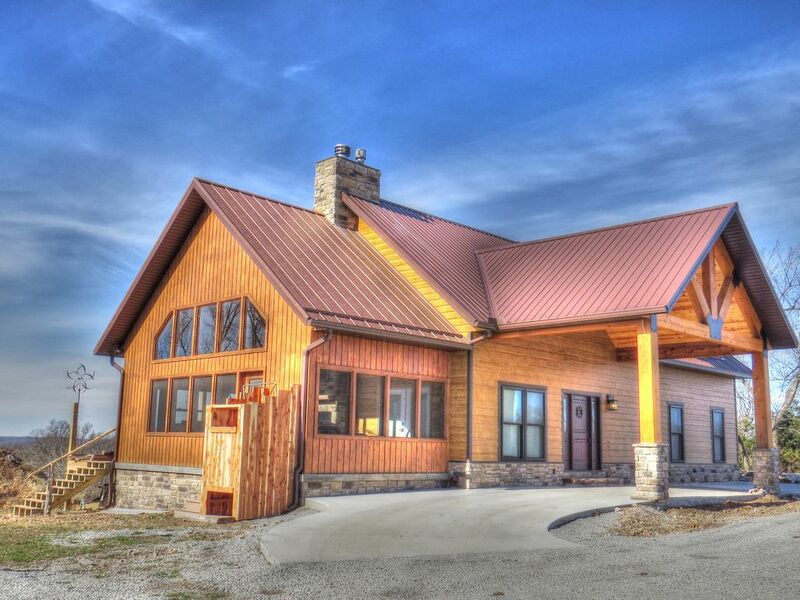 Ozark Outlook Retreat is located in the center of the Ozarks, making it a great place to call home on your vacation. You can experience all the local venues from water sports, hiking, fishing, caving, shopping, antiquing, etc. within one hour in any direction from our convenient location. 4:00pm Check in. 11:00am Check out. Minimum stay is two nights. 1 night, add $80 cleaning fee. Rental Rate is for up to four (4) persons. $25 per night additional per each additional person. Policy is that no refunds will be made due to reservation cancellation. The reservation may be re-booked for up to one year by the reserving party or transferred to another approved guest subject to approval of the owner and availability.